In December, a plane crashed into a Clairemont home, killing two passengers and one dog (at home). The residents had left ten minutes prior to the crash. "It's a constant barrage of planes sputtering and buzzing," said one resident that lives under Montgomery Field's flight path. Eden Yaege, Clairemont town council president said, "Many people have noticed that over the last few months there seems to be more aircraft flying out of Montgomery and it seems they are flying at a lower altitude. We have sent our concerns to the airport, only to be told that the airport is investigating. "We sent our concerns to our councilmember [Chris Cate] and were directed to the Smart Growth and Land Use Committee. We sent our concerns to the committee and they directed us back to the airport. In the meantime, the planes continue to fly over our homes, schools and businesses. Our residents have been complaining for over a year about the increased noise and now they add the fear of plane crashes to that list." Pilots use this aviation terminal chart all the time. Green lines show the distance between Montgomery Field and nearby airspace. Black lines show departure paths, while purple lines are arrival routes. Red squares depict altitudes (in hundreds, add two zeros) to follow (100/48 is busy airspace with airlines and jets; 32/SFC is busy airspace for military use; SFC/10,000 means heavy airline activity to the south). 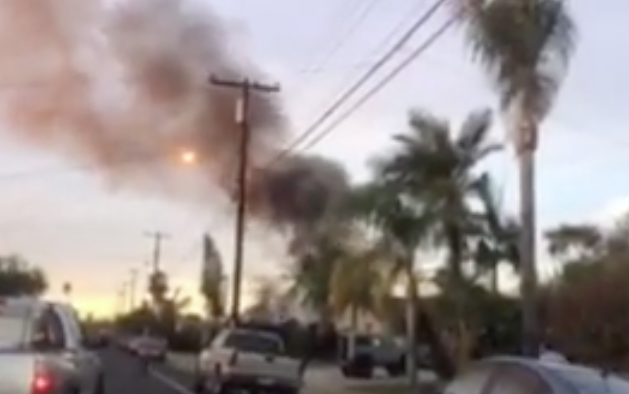 In February, a plane crashed in Kearny Mesa killing one (pilot). In December, a plane crashed into a Clairemont home, killing two (on plane) and one dog (at home). The residents had left ten minutes prior to the crash. Airport staff confirmed flight training is responsible for about 75-percent of Montgomery Field operations (40-percent are touch and go operations). Because of this, many want the flying clubs out of Montgomery. Per the city, they can't force them out since they are FAA-approved. Gurujan Dourson saw that December crash. He was walking his poodle Charlee when he saw an airplane coming at him from 20 feet away. After power lines knocked him off his feet, he saw the plane try to land in a nearby school yard before crashing into his neighbors house and exploding. After a second explosion, his poodle got hit by a truck — she was found days later hiding under a neighbors boat. Charlee now gets startled whenever a plane sputters or backfires. "If my car did that, I would immediately go to the mechanic." Dourson said he wants the city to finish undergrounding power lines. "The power lines that fell that day could have killed us." A March 2 internal city memo noted constituent's "elevated sense of concern" over plane crashes and "longstanding concerns about noise." It noted ten fatal aircraft accidents (21 fatalities) near Montgomery Field since 1983. Nationwide 2016 data showed almost 94 percent of aviation-related fatalities are general aviation (like majority of Montgomery flights). Over the past decade, airport operations (take-offs or landings) at Montgomery show five aircraft fatalities out of over 2 million operations. By contrast, Brown Field had more than twice the fatalities with less than half the operations. Operations at Montgomery between 2008 (233,744) and 2017 (207,103) remained fairly steady with the most being in 2008. The city's memo stated that Montgomery Field is "managed safely and efficiently." To the argument that the airport was there first, one resident responded, "If we had the same airport that was there before homes were built, I don't think anyone would be complaining." When Serra Mesa resident Gary Keller retired nine years ago, he noticed planes flying over his head every few seconds. This was his introduction to flight training touch and go operations. Keller's key concern is the harmful effects of aviation fuel (Avgas). Even though lead was banned in automotive fuel in 1996, it hasn't made that same sweeping transition in general aviation. Airport staff said the health and environmental impacts of Avgas is something they aren't "qualified to address whether it is or is not causing health problems." Keller argues that health impacts from lead are widely known and that it causes learning disabilities, especially among young children. "They are fine with discussing noise, but not so good about discussing the far more insidious problems of their lead emissions.” Last year, Governor Jerry Brown signed legislation to ensure children in California automatically get tested for lead. A study just released suggests deaths related to lead exposure are ten times higher than originally thought. According to one resident, Gibbs and CrownAir are the two aviation fuel suppliers at Montgomery Field. Cate held an event last week inside CrownAir's hangar at Montgomery Field. CrownAir was sued in 2011 for violating Proposition 65 (toxic enforcement act). The lawsuit stated selling Avgas exposed those nearby to lead without first warning them. As part of the settlement, CrownAir was required to post warning signs. Keller said Montgomery Field neglected to hang the signs. "When I pointed this out to them, they said they must have been stolen." He said signs were eventually posted. When it comes to noise, Keller said the ordinance residents fought for in the 1980s is ludicrous. "If you own a dog that barks and you do nothing, ultimately you could end up with [other enforcement measures besides a fine]. If you put wings on that barking dog, it becomes a plane, and it can continue to make the same noise, over a greater area, and there is nothing anyone can do about it." Airport staff confirmed noise violations have no other enforcement action beyond fines. Keller said even though Montgomery Field belongs to the city, the tenants seem to run the show. "Students from all over the world come to Montgomery Field to learn how to fly. It costs up to $50,000 to become a commercial pilot. Follow the money." Airport staff said most of the flight schools are non-profit "flying clubs" that are not master lease holders — the main source of revenue from them is through fuel purchases for which the city receives $300,000 annually (Montgomery Field and Brown Field combined). Fees go into the Airport Enterprise Fund with a revenue stream of about $5 million annually. John is a commercial pilot that flies out of Montgomery often. He said the planes look low to residents because they're taking off or landing. "The FAA does not allow you to be low in urban areas unless you're taking off or landing." John explained why pilots fly west over residential neighborhoods instead of east over industrial areas. He showed me an aviation chart that pilots use showing airspaces, altitudes, departure and arrival paths. He said the main reason the runways are pointing east/west is due to favorable winds, because it's safer and more efficient. He said most small aircraft take off heading west because larger planes are usually heading out east. There is also the matter of staying out of Miramar's military airspace. John confirmed a lot of foreign students come to San Diego to learn to fly because it's two to three times cheaper than at home. "The other reason is that San Diego's weather is clear, they can get their license quicker with less downtime. Montgomery has fewer clouds, the conditions are just right." John said that most general aviation planes run on low-lead fuel. "The planes have four cylinder engines, it's not bad for the environment. It's like a Honda Civic engine." Jeremiah Blattler, 2018 candidate vying for Cate's seat, lives in Northwest Clairemont and isn't thrilled with the airplane noise either and questions its continued operation. "This airport caters to flight enthusiasts and well heeled business class passengers, meaning it has little to no utility for the majority of constituents surrounding it." City staff said the draft master plan for Montgomery Field and Brown Field should be out by summer. Plans include a possible runway expansion to accommodate larger jets. Supposedly, the FAA is scheduled to replace Avgas in 2018. March 21, 2018 @ 6:55 a.m. If you are living in the flight path and you moved in after the airport was built then SHUT UP STUPID! March 21, 2018 @ 9:43 a.m.
March 22, 2018 @ 7:37 a.m. This airport is the base for the City of San Diego’s Airborne Law Enforcement (ABLE) operation. These are the police helicopters that support the Police department’s role in providing public safety for the entire City of San Diego. The City is fortunate to have this airport to serve these needs. This airport is the base for the City of San Diego’s Fire and Rescue helicopter operations. Its central location makes it the ideal location for these operations as well. Several Air Ambulance companies use this airport to transport sick and injured patients to and from local hospitals. Rady Children’s Hospital and Sharp are within just over a mile’s distance and helicopter and airplane crews are based at the airport 24/7 to support this need. Planes arrive and depart throughout the day and night from this airport transporting donated organs due to its proximity to several local hospitals. The airport is used by several federal law enforcement agencies for their airborne operations. Many of the students learning to fly out of Montgomery-Gibbs Executive Airport are veterans being trained to fill the shortage of commercial pilots. April 10, 2018 @ 11:30 a.m. Your company, CrowneAir, which was sued for being in violation of Prop 65 four years ago (you should know, you signed the consent agreement) is fully aware that there has been an unleaded fuel available for years. Why have you not made it available? The flight schools that you sell this fuel to who fly tens of thousands of touch and go operations at the lowest elevations, over an area which is the most densely populated having the most schools, day care centers and children between the ages of 12 and 24 months who are the most adversely affected by the lead emissions. We’re talking about Serra Mesa. You are quick with the canned speech about emergency services while you blithely look away from the generations of children who have been pummeled by lead from your fuel. Is it the profit margin because mogas is cheaper or are you still going with the storage excuse? March 22, 2018 @ 1:51 p.m. It's been there for nearly eighty years. These whiners moved in after it was already there. Too bad, so sad. Pack your bags, Jack. March 27, 2018 @ 9:27 a.m.